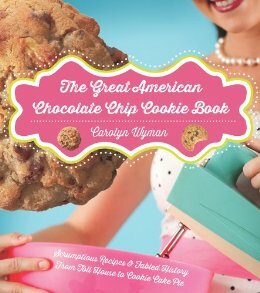 This chocolate chip cookie book writer rests on the expertise of all the chocolate chip cookie book writers who have gone before. That includes A Baker’s Field Guide to Chocolate Chip Cookies author Dede Wilson, whose neat Half and Half Chocolate Chip Cookies are highlighted in the p. 169 “Cookie Artist” sidebar of The Great American Chocolate Chip Cookie Book. Dede was nice enough to interview me on her Bakepedia website and also reproduced one of my personal favorite chocolate chip cookie recipes in my book (an award-winner from the late, great California Copia culinary center). Bakepedia’s other chocolate chip cookie attractions include contributor Lauren Chattman’s story testing whether it’s worth resting cookie dough on the refrigerator (Spoiler: It is, especially if you can wait for 36 hours) and recipes for one-bowl and giant chocolate chip cookies.